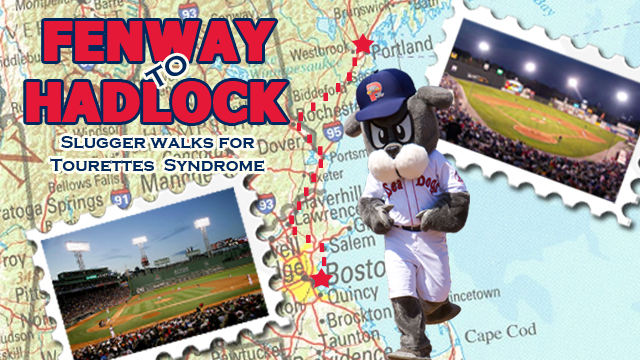 We at OTTO are thrilled to be Slugger the Sea Dog‘s Official Carb-Loading Sponsor for his walk from Fenway Park to the Portland Sea Dogs‘ Hadlock Field to benefit the The National Tourette Syndrome Association and Camp Twitch and Shout, a camp for children and teens with Tourette Syndrome. In celebration of the popular baseball mascot’s first appearance at Hadlock Field 20 years ago this spring, the Portland Sea Dogs on Tuesday afternoon announced a walking journey for Slugger and [Justin LeBlanc,] “his original trainer” from Fenway to Hadlock in early May to raise awareness of and funds for children with Tourette’s syndrome. LeBlanc’s fundraising goal is $20,000. He said the money will be split between two youth acceptance programs, a weeklong overnight camp in Georgia for kids with Tourette’s called Camp Twitch and Shout, and a youth ambassador program in which the National Tourette Syndrome Association trains teens ages 13-17 to teach understanding, sensitivity and tolerance. LeBlanc, now a lawyer in Portland, “animated” Slugger for the first three years of the franchise’s two-decade existence in Portland. He left after the 1996 season to attend law school in Georgia but has returned to Hadlock many times since to fill in. His youngest son, Theo, 11, has Tourette’s, a neurological disorder characterized by repetitive involuntary movements or vocalizations called tics. For more information, see the Portland Sea Dogs’ info page. Donations can be directed to the official Fenway to Hadlock ActiveGiving page.